Flying standby is never without a high risk of hazards and rewards. If you’re willing to chance the opportunity of flying at the last minute, in whatever open seat is available, to whichever destination the pilot happens to be flying, you’re going to have a great story at the end of it. Such was the case when we flew to Queen Beatrix International Airport on the Caribbean island of Aruba. 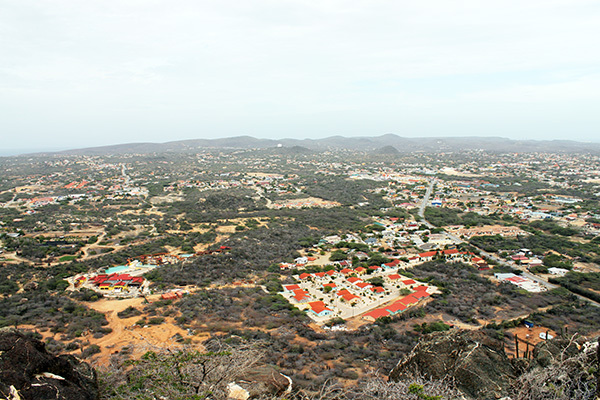 The island of Aruba is just 69 square miles with the airport located centrally on the western edge. It is the island’s only airport. Airport services include car rental and public transportation facilities and three floors of shopping, dining and entertainment outlets. 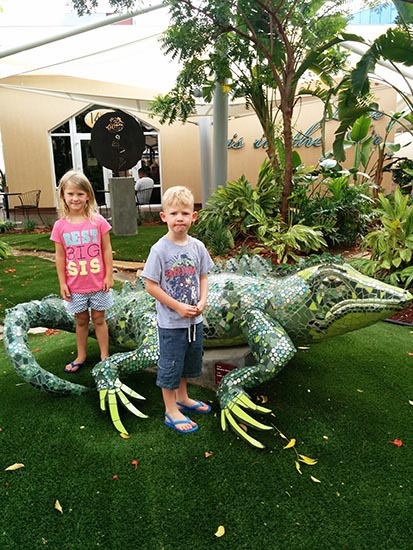 The Queen Beatrix International Airport is mid size with touches of the Caribbean throughout including mosaic tiled larger than life iguana statues. Our kids loved playing on and near these fun creatures. Much of the airport is open air, with the other half modernized and air conditioned. Note: You’ll pass through customs prior to departure, so you’ll want to plan enough time. It’s a smooth seamless process for both arrival and departures. All things considered, our flight into Aruba was uneventful, but we did change our flight at the last minute to a different carrier due to a delay that would have made us miss our connection. Because our bags were already loaded onto the airplane and there wasn’t time to notify anyone or make the switch, and we wanted them there in Aruba anyway, we left them on the original carrier. After we arrived though, we had to track down our bags. We found the ticket counter for our original airline and started the inquiry process. 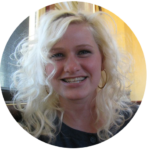 Like a hot potato, I was shuffled through no less than five different employees. Each employee took me a length of a football field and then passed me on to the next person like a baton in a relay race. I traversed the entire web of intricate employee only access points to find my bags inside a huge warehouse airport hangar. Then I was left to find my way back to my family without any guidance. I made it through the Queen Beatrix International Airport maze, by way of my own genius to find the kids eating a platter of mini Cinnabon’s ready to start our adventure! 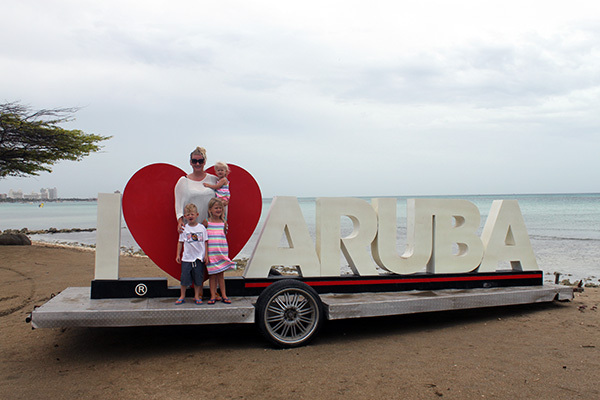 Check out all of our family experiences in Aruba (coming soon) and all of the Caribbean! Aruba is fantastic, Im sure you had a great time. Thanks! We have a lot more to say – it’s coming! We’d love to hear what you did there!